WESTBURY Stud general manager Russell Warwick was certainly heartened to see multiple Gr.1 winner Reliable Man (GB) get a 5.5 length juvenile trial winner over 800m in early October. 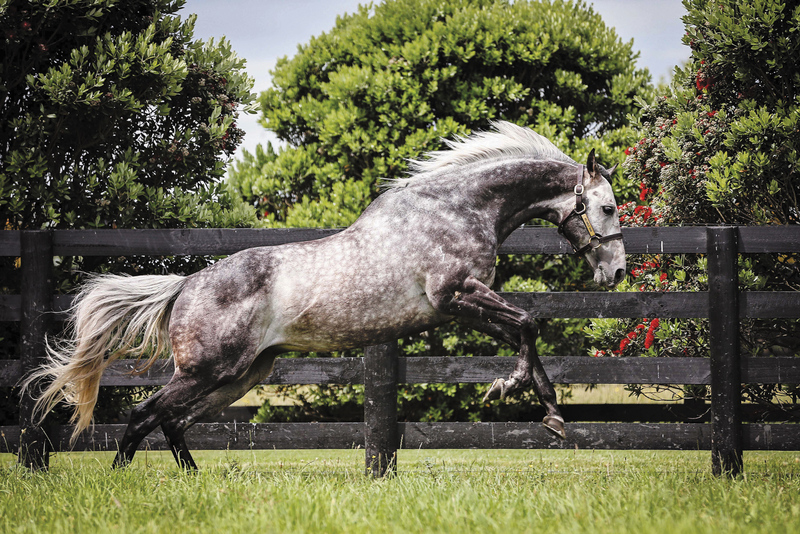 For a horse who won the French Derby-Gr.1 and also raced away with the Queen Elizabeth Stakes-Gr.1 at Randwick it was a heartening sign indeed and points to a bright stud future for the handsome grey. “Not for one minute did we expect to see the progeny out and running over 800m as two year-olds, so it’s pleasing to see him have a trial winner and a runner in an early juvenile event,” Warwick said. It’s good news too for the buyers who paid up to $340,000 for his first southern yearlings in 2016. The gelded trial winner, who is unnamed, is from Wannabe Queen (by the Storm Cat son Bernstein) and is inbred 3fx3f to Sadler’s Wells and trainer Jamie Graham has put the talented first crop youngster aside until later in the season. Reliable Man (Dalakhani (IRE)-On Fair Stage by Sadler’s Wells) won five of his 14 starts (10 in Gr.1 events) and $1.85m. Trained in France by Alain de Royer-Dupré, Reliable Man replicated the deeds of his sire Dalakhani and grandsire Darshaan when winning the Prix du Jockey Club-Gr.1 (French Derby) over 2100m and was ranked one of the best three year-olds in Europe. Despite not recording a victory in his four year-old season, Reliable Man competed in the best of company throughout, finishing on the heels of the world's highest rated horse Cirrus des Aigles when third in the Prix Ganay-Gr.1 and chasing home headline acts Danedream, Nathaniel and St Nicholas Abbey when fourth in an outstanding renewal of the King George VI & Queen Elizabeth Stakes-Gr.1 and was also fourth behind So You Think in the Prince of Wales’s Stakes-Gr.1. He also won the Prix Niel-Gr.2 (2400m) and was third in the Grand Prix de Paris-Gr.1 (2400m), both at Longchamp. He had a Timeform rating of 124 at three and four and a World Thoroughbred Ranking of 122 in 2011, 2012 and 2013. “To win a Derby at just his third lifetime start (he won his first two starts at 2000m at Chantilly and Saint-Cloud) is some feat, and with 10 of his 14 starts coming in Gr.1 races, Reliable Man never dodged a fight. He has strong form around the likes of Cirrus des Aigles, Danedream and So You Think,” Warwick said. Transferred to champion trainer Chris Waller’s Sydney stable, Reliable Man made his Australian debut in the George Ryder Stakes-Gr.1 over 1500m against a stellar field, which included Pierro, (King) Mufhasa, Shoot Out, Manighar, Danleigh, Veyron, Happy Trails, Solzhenitsyn, Fontelina, and Rebel Dane. Not having raced for six months, the grey stallion settled well back in the running finished well for sixth and was just 1.5 lengths off the winner Pierro. “I have no doubt that had we had a longer preparation leading into his first Australian start, I believe he could have won the George Ryder Stakes first-up,” Waller said. A dominant 2.25 length victory followed at 2000m in the Queen Elizabeth Stakes-Gr.1 when downing star three year-old (It's A) Dundeel. Also among the beaten brigade were Gr.1 winners Happy Trails, Silent Achiever, Secret Admirer, Manighar and Glass Harmonium. Sadly, that was Reliable Man’s farewellperformance with a tendon injury forcing his premature retirement. “He gave me an unbelievable feel in the Queen Elizabeth, and he is just all quality, possibly the best I have ridden," jockey Hugh Bowman said. The grey ran the fastest time for the 2000m race since 1997, running 2:01.80, faster than the likes of Might and Power, Lonhro, Desert War and More Joyous. He was quickly snapped up by Gerry Harvey on his retirement to stud and sent to Harvey’s showplace NZ stud Westbury, which comprises two properties, the 86ha (212 acre) stallion and yearling farm at Karaka, close to NZB’s outstanding auction facility, and 121ha (300 acres) of prime land in the Waikato, which is home to Harvey’s more than 180 NZ-based mares. Westbury is also home to Makfi (Dubawi), Swiss Ace (Secret Savings), Redwood (High Chaparral), El Roca (Fastnet Rock), Postponed (Summer Squall) and Red Giant (Giant’s Causeway). Reliable Man’s sire, Dalakhani (Darshaan-Daltawa by Miswaki), bred by the Aga Khan and recently retired from stud duty, was Horse of the Year and Champion Three Year-Old in Europe in 2003 when his wins included the Arc de Triomphe. He has sired 324 winners (58% of starters) of more than $36m and his 49 stakes winners (8.8%) include eight at Gr.1 level, notably the champion Conduit (Sadler’s Wells) whose seven wins included the Ascot King George VI and Queen Elizabeth Stakes, the St Leger and Breeders’ Cup Turf (twice). He is also sire of Champion Older Female (UK) Integral (Danehill), winner of the Falmouth Stakes and Sun Chariot Stakes, Champion Older Female (IRE) Chinese White (Sadler’s Wells), German Gr.1 winners Seismos (Dashing Blade) and Second Step (Sadler’s Wells), St Leger winner Duncan (Danehill) and Irish Oaks winner Moonstone (Law Society) and of course Reliable Man. He also has Group winners out of mares by Barathea, Dynaformer (Guardini, a Gr.2 winner in Germany and Gr.3 winner in Australia), Generous, Rainbow Quest, Unfuwain, Lure, Diesis, Silver Hawk, Caerleon, Nishapour, Polar Falcon, Platini, Pivotal, Grindstone, Alzao and others by mares from the already mentioned Sadler’s Wells and Danehill. Dalakhani’s parents descend from mares acquired by the Aga Khan in the 1970s from the bloodstock dispersal of French textile magnate Marcel Boussac, one of the great thoroughbred breeders of the 20th century and 19 times the Leading Owner in France and also Leading Owner in Britain in 1950 and 1951. The sire line, that of Mill Reef (Never Bend-Nasrullah) is one that has been carefully nurtured by the Aga Khan and has proved particularly suited to all things Sadler’s Wells, as a glance at the pedigrees of Dalakhani’s Gr.1 stars reveals. is the fourth dam of Darshaan, Darara and Dalara (dam of Daliapour). Darshaan (Shirley Heights-Delsy by Abdos) was the Champion Sire in France in 2003 and was a Champion Sire of Broodmares in Britain/Ireland and in France. His sire, the English and Irish Derby winner Shirley Heights (Mill Reef-Hardiemma by Hardicanute), was 1978 Horse of the Year in England and his 61 stakes winners included a seven-length English Derby winner Slip Anchor. Mill Reef (1968-86, Never Bend-Milan Mill by Princequillo) was also a Horse of the Year in England and won 12 of his 14 starts at two and three including the Dewhurst Stakes-Gr.1 at two and the English Derby, ‘King George’, Eclipse Stakes and Arc de Triomphe at three. Dalakhani’s dam Daltawa, by the Prix de la Salamandre winner Miswaki (Mr. Prospector-Hopespringseternal by Buckpasser) won twice at 2000m in France at two and three including a Listed event and was a Gr.3 runner-up. She had been paired with the Mill Reef line before, going to English 2000 Guineas winner Doyoun (Mill Reef-Dumka by Kashmir), a horse inbred 4mx5f to Mumtaz Begum, to produce the European Horse of the Year of 1999 in Daylami, winner of 11 races including the Breeders’ Cup Turf, ‘King George’, Coronation Cup and the French 2000 Guineas. Daltawa’s sire Miswaki is one of the best stallion sons of Mr. Prospector and best know for his Arc-winning daughter Urban Sea, dam of champions Galileo (Sadler’s Wells) and Sea The Stars (Cape Cross). Reliable Man’s dam is the stakes winning Sadler's Wells mare On Fair Stage and he is a half-brother to the Listed winner Gale Force (Sinndar) and the talented I'm Imposing (Danehill Dancer), a dual Gr.3 winner in Australia and Gr.1 placed in the Doomben Cup. His second dam is the high-class race mare Fair Salinia (Petingo-Fair Arabella by Chateaugay), winner of the English, Irish, and Yorkshire Oaks, all Gr.1, and dam of seven winners including other SW Perfect Vintage (Shirley Heights) and Perfect Circle (Caerleon). This is family 16c and fifth dam is the Gr.1 winner Snow Goose, a daughter of Derby winner Mahmoud and noted producer Judy O’Grady (Man o’War). It is the family of successful sires Grey Dawn and Green Dancer. Reliable Man’s 2016 fee is $NZ15,000, plus GST, and he has covered big books in his four southern seasons.